Vapor storm Puma Kit comes with stable chip, scratch-proof design, 2ml liquid capacity and ect to bring enjouable vaping for you. No hesitation. Just take it. Vapor Storm Puma Kit, which is powered by dual 18650 batteries to fire up to 200W to deliver pure flavor and denser cloud, comes with several protections that include overvoltage protection, over power protection, temperature protection and etc to ensure high performance. In addition, it adopts stable chip to ensure high performance and 2ml liquid capacity to meet your daily needs. Fall-proof and scratch-proof design will also protect the kit to some extent. Just take this light-weight kit to enjoy vaping. • Three-month warranty for Puma Box Mod and Hawk Tank. • Quick link: Vapor Storm Puma Mod. It's a week before packaging in good condition of content too. But why does the coil "" coil need not to touch 60 w at least more powerful to place. And everything is fine. 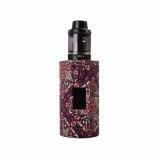 200W Vapor Storm Puma Kit with Hawk Tank Vapor Storm Puma 230 Kit comes with a Puma 230 Box Mod and a Hawk Tank. The Puma 230 Mod, powered by dual 18650 batteries, is able to reach up to a maximum output power of 200W.